Beach tennis or beach paddleball, as some people call it, is a lot of fun. It’s quite a new game that combines the elements of volleyball and tennis. The Israelis, the Italians and Brazilians have been playing the game for a while now, and the Italians are considered world leaders. Americans have been playing the game only for a little more than a decade, since the sport was brought from Aruba. So, the rules are not written in stone yet, and could possibly change at the behest of the ITF (International Tennis Federation). Armed with the basic rules of the rulebook and suitable equipment, you can hit the sand any time for a game of beach tennis. A tennis ball and paddle racket is the equipment you need to play the game. When you’re shopping for a stringless beach tennis paddle, the first thing you’ll need to consider is whether the paddle is for a beginner, an intermediate player or an advanced player. The paddles come in various prices. Beginners will want to go for the cheaper rackets to find out if this is a sport for them. Intermediate players and advanced players will go for the more expensive rackets, which can start at a sub-$50 price and go up to sub $100 prices or more depending on the quality. Two other important factors to consider are the length and the weight of the paddle. A longer paddle with a heavier weight, you’ll get more power out of your racket. This type of racket is great for playing towards the back of the court. A lighter, shorter racket is better for the forecourt and gives you greater control and maneuverability over the ball. If you play the usual doubles style game, you’ll find that it helps to have someone with a heavier racket take the shots from the back of the court. Their partner can take the shots near the net. A good beach tennis paddle will have a handle that is a comfortable fit for your hands. You should also go for a racket that is light enough for you to wield comfortably yet heavy enough for powerful swings. Here is a look at some of the best beach tennis paddles you can choose from today. IANONI is a top manufacturer in the racket sport equipment industry, designing paddles that are suitable for pros and tournaments. This carbon fiber grit racket with EVA foam core has several technologies to make it good for maneuvering. The outer surface is made of carbon fiber. The toughness of the carbon fibers makes the paddle head durable. But the ability of graphite fibers to be compressed gives it a sort of stiffness and responsive flexibility that gives you a lot a of impact traction over the ball. The surface gives you better control over the ball, and it helps that the paddle is lightweight at around 310 to 330 grams. 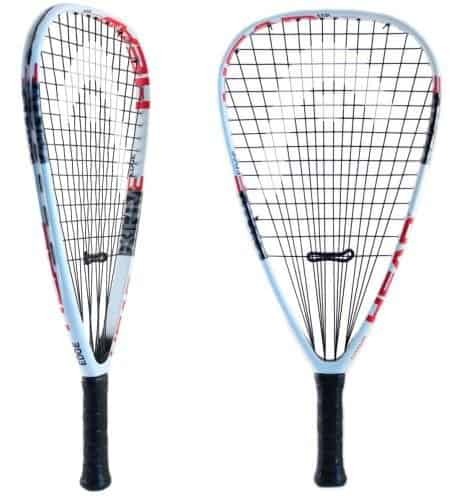 The length of 19.29 inches is also good for maneuvering the racket without compromising reach. The grip is 5.31 inches that bigger hands can comfortably grip. Another highlight of the paddle is the 20mm EVA memory foam core. 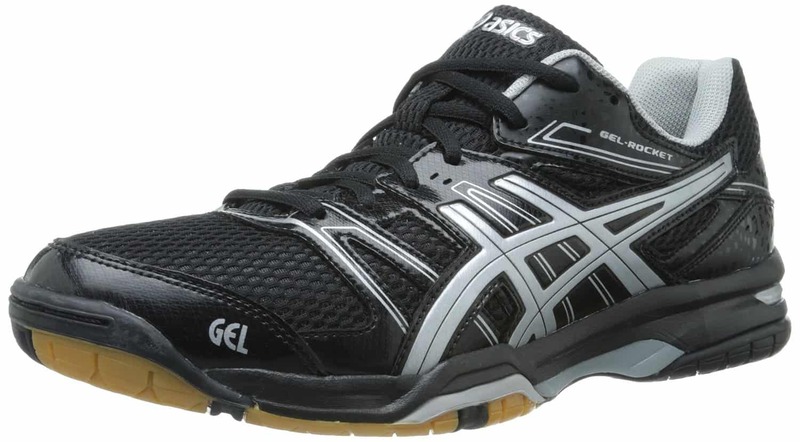 This hybrid technology creates an EVA foam that is stiff and lightweight for good feel. The textured grit surface helps players to put a spin on their ball and generally have great control on the court. 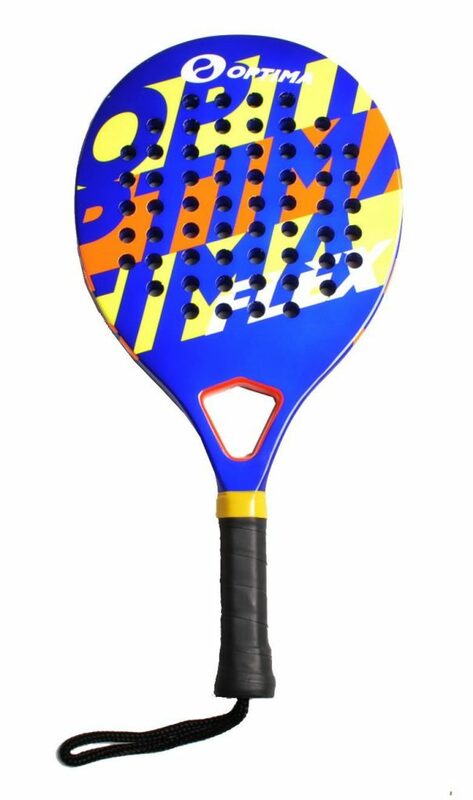 This Ianoni paddle is a lightweight, reasonably powerful racket that performs quite well on the beach. It has an attractive appearance as well, with splashes of vivid color on a black, blue or white body depending on the model you purchase. The price is also on the lower side, at sub-$50. The manufacturers have spent a lot of time on the details of the paddle. If you’re looking for a racket that will make your recreational beach tennis fun, or if you want to play occasionally, the Ianoni paddle is a good addition to your beach tennis equipment. 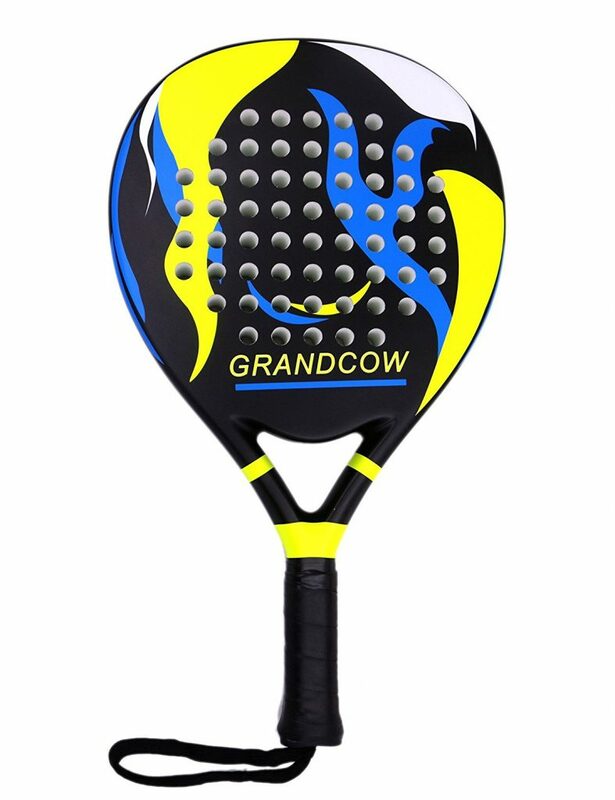 This Grandcow paddle is designed for pros. Grandcow designs some top quality graphite sticks for lacrosse and hockey. The Tennis Padel is a highly rated paddle that’s good for pop tennis as well as paddleball. The mandatory EVA memory foam makes the racket lightweight at 350 grams, so that you can maneuver it easily on the court. Like all good paddles, the racket has a carbon fiber weave construction for greater toughness and durability. The strength of the graphite adds to the racket’s power. Another special feature of the racket is the precision drilled holes on the sweet spot for more bite on every hit. This aerodynamic pattern of holes is present on most intermediate and pro beach tennis paddles. Pro players prefer a very stiff paddle that limits the damping during impact with the ball, so that most of the ball’s power is converted into power for the return shot. Most manufacturers drill these holes in random patterns without a lot of thought given to the drag produced by the placement of the holes. The Grandcow paddle has a pattern that produces less drag than many others in the market. 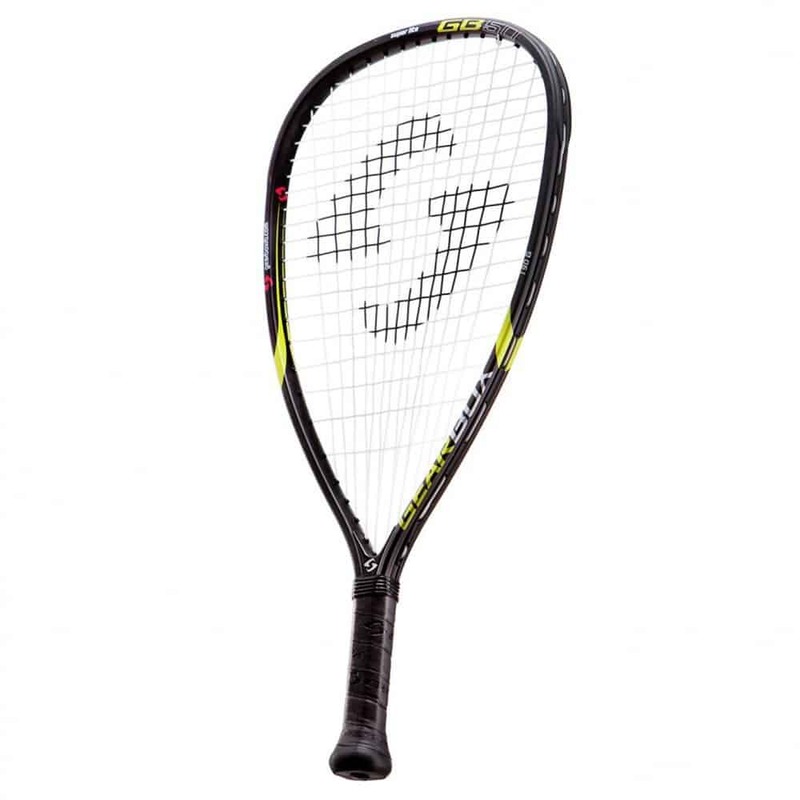 The grip is soft and the racket’s performance is stable. It is 18 inches long and has a thickness of 10.2 inches. Some pro players may prefer a rigid center free of holes for even less damping. Overall, this is a good racket that performs well on the court. If you’re looking for a paddle that has a sub-$100 price but is made of superior quality materials then the Grandcow paddle is a good choice. It is comfortable to play, lightweight and strong. This affordable paddle gives you a bang for your buck at less than fifty bucks. It weighs 330 grams and is 20 mm thick, which makes it lighter than many other paddles in the market. It has the generic hole pattern on the head. The outer shell is composite carbon and the core is EVA foam. Composite carbon is a very strong and light plastic reinforced with carbon fibers. It’s twice as stiff as steel and five times stronger. What sets the Optima paddle apart is the reinforced sweet spot, which makes the paddle quite powerful. The handle is comfortable and so is the grip. If you have smaller hands, you may find the handle a little thick. Many players prefer to shave the handle down to a size that suits them. The smooth finish on the racket takes away from its ability to grip the ball. As a result, this is a good beginner’s racket but pros will prefer something that has more texture. The paddle is lightweight, but as you’d expect with the low price the quality doesn’t match that of high-end paddles. It is not advisable to put the Optima paddle through a lot of rough use. But if you’re an occasional player or just picking up beach tennis, this is a good and affordable option. This is another IANONI offering that makes our list because of a good balance of price and quality. The sub-$50 paddle is good for beginners who prefer to hit rather than put a spin on the ball. It has a smooth surface that is made of carbon fiber. This material adds to the paddle’s stiffness and makes it a good hard hitter. If you’re looking for a paddle that will give you a powerful swing, this Ianoni paddle is a good option. It’s a little on the heavier side compared to some of the other paddles on our list, weighing between 340 and 360 grams. But it’s still light and reasonably maneuverable for when you want to control the ball a bit in the middle of the court. Another feature is the extended length. At 18.30 inches, the paddle is at a medium length that still lets you reach out and take a shot. The grip is a standard 5.31 inches that is good for big hands. You may want to shave the handle down if you find it’s too large for you. 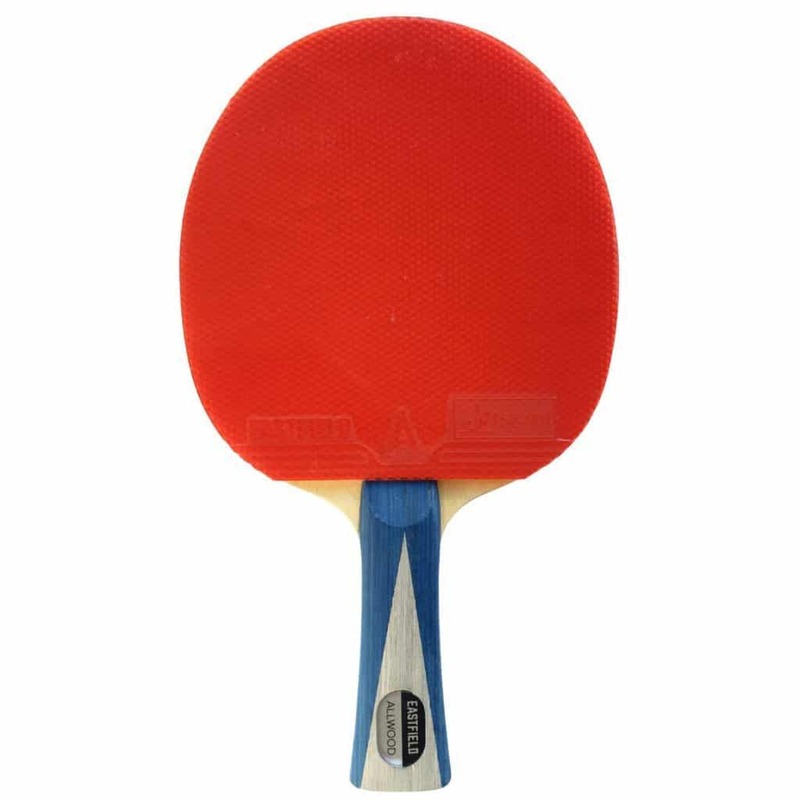 The EVA memory foam core is the same as you’ll find on the other Ianoni paddle on our list. Memory foam is known to be springy, so it adds to a trampoline effect on the ball as you return your opponent’s shot. This means the racket does a lot of the work for you, and you have to use less effort to achieve a certain level of power. The paddle is available in five attractive designs. If you’re just picking up beach tennis and don’t need a textured surface for spinning your ball, the Ianoni paddle is a comfortable and powerful option to choose. The paddle looks great, is comfortable to play with, and as long as you don’t get a bad batch (which you can return) it will last several games. It’s affordable too, so it won’t be fair to expect the quality of high-end paddles at this price! The Pro Kadima beach paddles are evidently for beginners. The price is a reflection of the amateur design of the paddle. But as far as beginner paddles go, you can’t go wrong with this option from Pro Kadima. Kids will particularly enjoy the brightly colored and lightweight paddles that will get them started on the fun game of beach tennis. Pro Kadima makes some popular solid surface paddles for the sport. The original Pro Kadima paddles have been traditionally made in Israel. While they may offer a lot of drag, they are small and lightweight enough for kids and even adults to enjoy an occasional game of beach tennis. These are classic wooden paddles that are finished with vivid colors for an attractive appearance. It’s best not to take these paddles into the water for this reason. On the other hand, many players have taken these to the beach and the wet paddles have not lost performance. If your kids have played table tennis, they’ll be quick to get used to these paddles. At such a low price, it’s a good set to let the kids have fun with. If you’ve played with Kadima paddles growing up, then you may find that the quality is not the same. However, with a little care and avoidance of rough use, you should be able to get hours of enjoyable play out of these paddles. This Pro Kadima paddle is great for kids but it’s good for adults as a party game too. The set comes with a ball that is easy to lose, so it’s best to buy a few extra balls. As long as you don’t expect high-end quality from a paddle that costs 10 bucks, you should have a lot of fun playing with the paddles occasionally at the beach and elsewhere. We hope this list of best beach tennis rackets will help you choose what you really want to up your game. In case of any query regarding these beach tennis paddles, you can comment below.